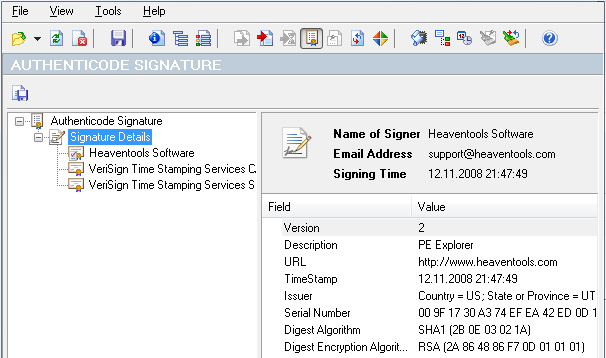 PE Explorer: Debug Info Viewer, Digital Signature Viewer, Relocation Viewer, Strip Tools and TimeDateStamp Adjuster. After running into a number of difficulties creating interops for some COM DLLs, I realized I needed a tool that could extract specific type libraries from DLLs. Even Microsoft's OleView won't give me access to a specific type library from dll. Anyway, I searched google.com for a Resource Viewer and you were right in the top of the list. I played with your trial version for only a few minutes and I was hooked! It's even more than I was looking for and I'm happy to add it to my arsenal of tools. Thanks, I use it constantly it's a great program. Excellent for debugging & distribution problems: what DLL's to include or exclude in Installation scripts, etc. Sometimes it's absolutly necesary when working with 3rd party components and have to check which DLL's & OCX's to deploy and distribute. PE Explorer also comes with a Digital Signature Viewer, Debug Info Viewer, Relocation Viewer, Strip Tools and a TimeDateStamp Adjuster. The Authenticode Digital Signature Viewer lets you view the certificate-based digital signature of a executable file, validate the identity of the software publisher, and verify that the signature of a PE file is valid and has been applied properly. PE Explorer examines the certificate and obtain the developer's public key from the certificate. Then PE Explorer decrypts the message digest with the public key, and the same hash algorithm that was used to create the message digest is run on the code again, to create a second message digest (Real File Hash). Then PE Explorer compares the second digest (Real File Hash) to the original (Signed File Hash). Additionally, it compares the Real Checksum to the value reported by the header (Link Checksum), since the file checksum field of the optional header can be modified without invalidating the Authenticode signature. This displays the debug information contained in the file. When an executable is built with debug information, it is customary to include details about the format of the information and where it is. The operating system does not require this to run the executable, but it is useful for development tools. An EXE can have multiple forms of debug information, an array of data structures known as the debug directory indicates what's available. These structures hold information about the type, size, and location of the various types of debug information stored in the file. Three main types of debug information are CodeView, COFF, and FPO. 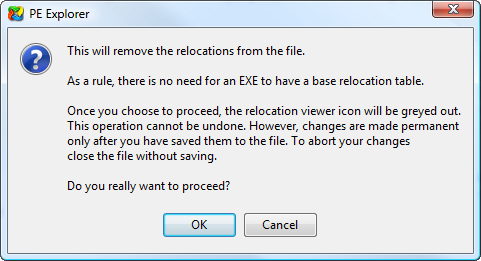 The Remove Relocations tool determines whether a file is a DLL or driver and warns you in each case. Since DLLs and drivers require a base relocation table, removing any of those relocations can result in corrupted files, and it is very likely that the newly saved file will appear to be invalid. We highly recommend that you do not run the Remove Relocations tool on DLLs and drivers: base relocations should always be left in. If you want to take a chance you can proceed with removing Relocations, but please make a backup copy of the target file before making any changes to it. 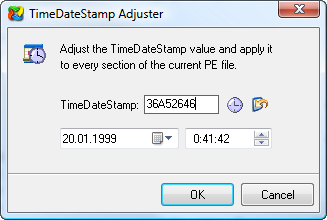 Selecting "TimeDateStamp Adjuster" from the Tools menu will display the Adjuster dialog.